Fantastic! Now that your Bezlio account is set-up, the next step is to connect your account to your data sources inside of your firewall. On the next screen, fill in the ‘Connection Name’ field with a name that would be meaningful to represent the network you intend to connect to. Typically we suggest just making this your company name with no spaces. After a few moments you will be returned to the ‘Data Connections’ panel. Note the ‘Connection ID’ and ‘Connection Token’. 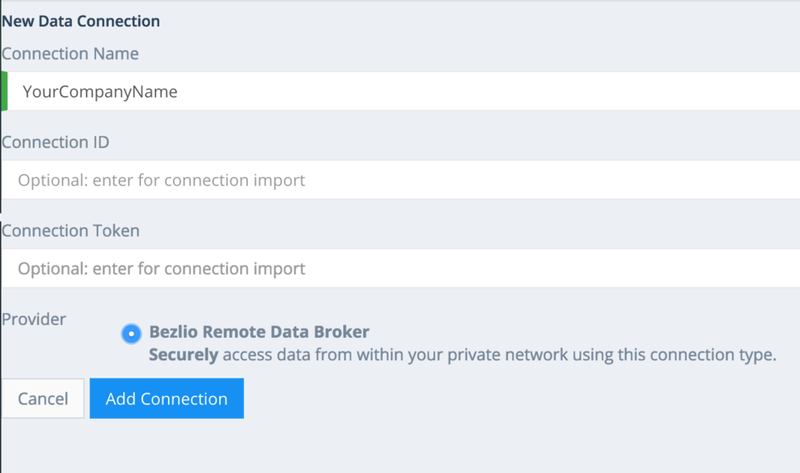 Next, click the button labeled ‘Download BRDB’ and save the resulting file to a location on your network accessible to where you would like to load Bezlio Remote Data Broker. From the server where you would like to install Bezlio Remote Data Broker (BRDB), execute the installer downloaded from the previous step and accept all of the defaults. You may wish to uncheck the plugins you don’t intend to use during this process or those can be disabled at a later time. Upon completion of the installation, navigate to the ‘Services’ control panel (on modern versions of Windows, click the Start button, type ‘Services’, and click on the icon that results), right-click on the service ‘Bezlio Remote Data Broker’, and press ‘Start’. On this dialog, fill in the ‘Connection ID’ and ‘Connection Token’ as noted on step 2 and click ‘Save Trusted Connection’.